I promised myself that I would not buy any more stationery until I had reviewed all of the items I had already bought, which is to be honest a ridiculous requirement, and the consequence is that I have just ordered some more. Perhaps this will teach me not to set myself such impossible goals to which I know I will not keep. I am therefore modifying the promise to be “at least one-in-one-out”. With this in mind, I have to review two items now, and the first might as well be the Airmail 69L eyedropper which I’ve been using for a couple of weeks now so can reasonably comment on. The 69L is made in India – I understand that the company has two main lines, the Wality (I have a couple of these too) which is designed for export, and the Airmail, which isn’t, despite the name. I purchased mine from the seller ashishwakhlu via a sales post on Fountain Pen Network for a very reasonable sum, and at time of writing there are three left, but I understand that they are also for sale on eBay. You’ll see that it is pretty big – it might be a bit much if you have teeny tiny hands, though I didn’t find it too bad even though I mostly prefer smaller pens. You will also see that it holds a lot of ink. Some readers might not be familiar with the “eyedropper” filling mechanism – this is one of the earliest and simplest systems. 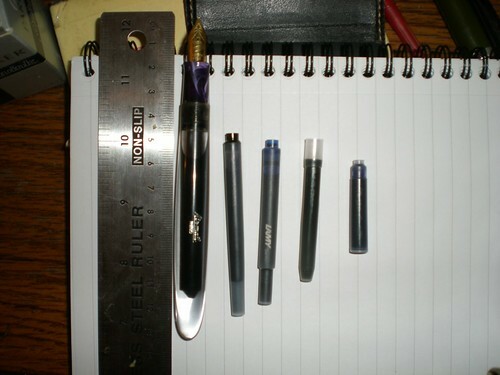 Instead of inserting cartridges, or putting the nib into a bottle of ink and sucking some up with a piston or a squeezy sac, one just unscrews the top of the pen and pours ink into the reservoir. (The name “eyedropper” refers to the common use of an eyedropper to do this, and some antique ink bottles had integral eyedroppers in the caps. Some – e.g. the 4.5oz bottles of Noodler’s inks – still do, but otherwise you will need your own eyedropper, or syringe, or very small funnel, or miniature squid, or other). Eyedroppers have their issues – they’re a bit awkward to fill on the move, they can be messy to fill, and when they are low on ink the heat from your hand can make the air in the reservoir expand slightly which results in the odd blob coming out of the nib. They do, however, excel in terms of simplicity (there’s simply nothing to be broken) and capacity. There is no filling mechanism to take up space inside the barrel and so the whole thing can be filled with ink. The Airmail holds about 4.5ml of ink, which is around 3 times as much as a piston-filler or gel pen, and you can easily see how much is left and top it up, say, before a trip or exam. The nib is a fine one1, and of good quality – smooth and a comfortable writer. Combined with the huge capacity this means that you’re even less likely to run out of ink. I’ve not had any issues with starting or writing; flow seems good and regular. 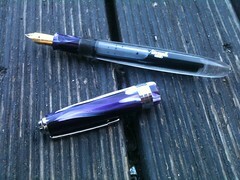 The pen feels tough and secure when held – thick plastic with a screw-on cap – but it is not heavy, and the balance is good, not too biased in any particular direction (I’ve not written with it posted, nor would I want to, but the cap is not too heavy). 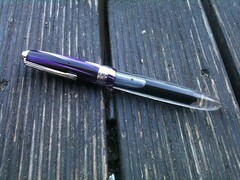 In terms of looks, I’m not a fan of showy pens, but I find the swirly purple colour attractive and not distracting – in any case it balances the simplicity of the transparent barrel. Overall, I’m very happy with the Airmail. 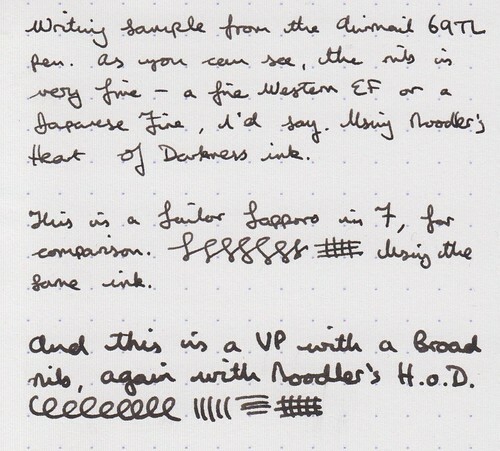 I have it loaded with Noodler’s Heart Of Darkness and it’s become a general go-to – comfortable and useful for all purposes, very much a “desert island pen”. Certainly for the money it’s of excellent quality, and if you like a fairly fine nib and do not have an issue with largish pens, I would definitely recommend it. Yes this pen name is various in India. Where they call it as Airmail or Wality. But OS model is 69TL. I bought 30pc of these pens. Regarding the price its quite good quality. But the nibs needs to smoothing by a master. I done this operation and I use 4 pc. of these FP as my daily FP pens. Very strong pens.